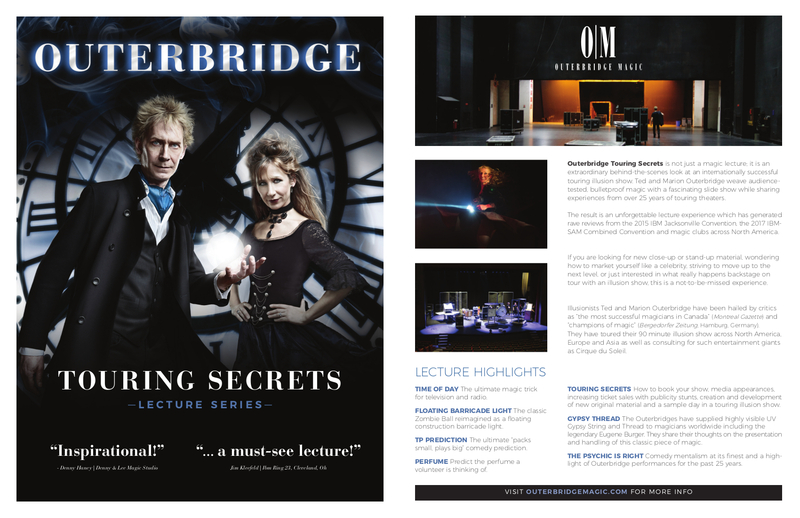 Outerbridge Touring Secrets is not just a magic lecture, it is an extraordinary behind-the-scenes look at an internationally successful touring illusion show. Ted and Marion Outerbridge weave audience-tested, bulletproof magic with a fascinating slide show while sharing experiences from over 25 years of touring theaters. The result is an unforgettable lecture experience which has generated rave reviews from the 2015 IBM Jacksonville Convention, the 2017 IBM-SAM Combined Convention and magic clubs across North America. If you are looking for new close-up or stand-up material, wondering how to market yourself like a celebrity, striving to move up to the next level, or just interested in what really happens backstage on tour with an illusion show, this is a not-to-be-missed experience. Illusionists Ted and Marion Outerbridge have been hailed by critics as “the most successful magicians in Canada” (Montreal Gazette) and “champions of magic” (Bergedorfer Zeitung, Hamburg, Germany). They have toured their 90 minute illusion show across North America, Europe and Asia as well as consulting for such entertainment giants as Cirque du Soleil. TIME OF DAY – The ultimate magic trick for television and radio. FLOATING BARRICADE LIGHT – The classic Zombie Ball reimagined as a construction barricade light. TP PREDICTION – The ultimate “packs small, plays big” comedy prediction. PERFUME – Predict the perfume a volunteer is thinking of. TOURING SECRETS – How to book your show, media appearances, increasing ticket sales with publicity stunts, creation and development of new original material and a sample day in a touring illusion show. GYPSY THREAD – The Outerbridge’s have supplied highly visible UV Gypsy String and Thread to magicians worldwide including the legendary Eugene Burger. They share their thoughts on the presentation and handling of this classic piece of magic. THE PSYCHIC IS RIGHT – Comedy mentalism at its finest and a highlight of Outerbridge performances for the past 25 years. For more information about making the Touring Secrets lecture the hit at your club or convention, click here. Download the OUTERBRIDGE TOURING SECRETS LECTURE information sheet here.